Easter is upon us, and I always love to see the creative ideas that people have for decorating Easter eggs. 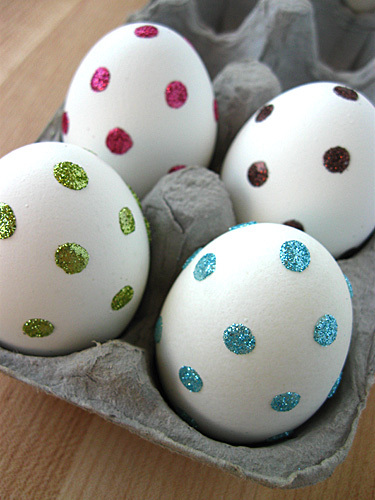 This year, I’ve added my own egg craft to the mix: sparkly polka dotted Easter eggs. It took a bit of experimenting (and some broken eggs) to get the look that I wanted, but the result is more than worth the relatively little effort that it takes to make these pretties. The microfine glitters can get a bit messy, but in my book this just adds to the fun! At the bottom of this tutorial, I also have a kid friendly version that uses decorative sugar. eggs – I’ve used hard-boiled eggs, but if you would like to use the eggs in the future, you can also use eggs that have been blown out. zots clear adhesive dots – These can be found in the scrapbooking aisle at most craft stores and come in a variety of types and sizes. I’ve used the small type that come in the purple box. microfine glitters – Martha Stewart has a wonderful collection at Michael’s. You can purchase a kit that has 25 or more shades for about $30. The glitters that I used are not from the Martha Stewart line, but you can also find them at Michael’s. They came in a sample pack with 16 shades. The package says “Glitter Sample Pack” and costs about $4. It’s perfect for a small project like this. 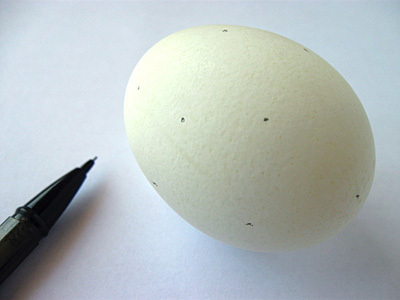 Using a pencil, pen, or marker, make small dots all over the egg in the pattern that you would like on the egg. These dots will act as guides when you apply the Zots. 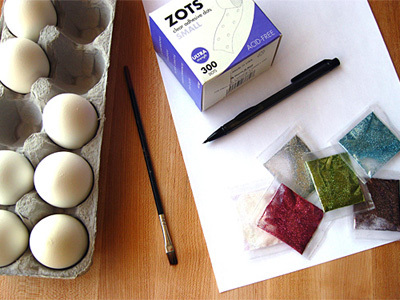 Take the sheet of Zots and press them onto the eggs, one by one, using the pencil dots as guides. Note: Try not to set the egg Zot side down on any surface at this stage, as the Zot may stick to the surface, and part of the egg shell will break off when you attempt to lift the egg from the surface. Trust me on this one. 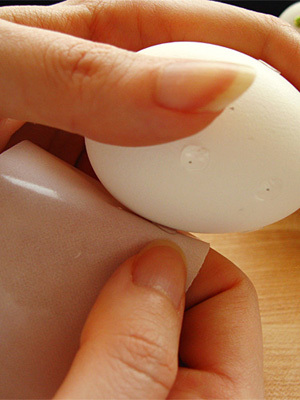 After you’ve finished applying the Zots to the egg, place a piece of paper on your work surface and start to apply the glitter to the egg, turning the egg in your hand as you work. You may find that some of the adhesive dots haven’t been covered in glitter. You can re-sprinkle glitter over these dots, or you can gently roll the egg in the glitter that’s gathered on your paper to fully cover all of the Zots. 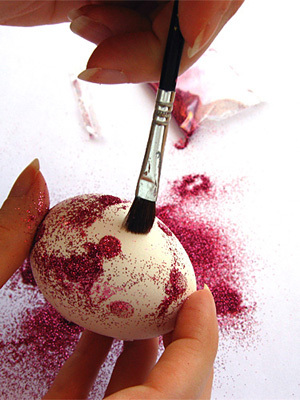 After all of the Zots are fully covered, take a small paintbrush and brush the excess glitter from the egg’s surface. 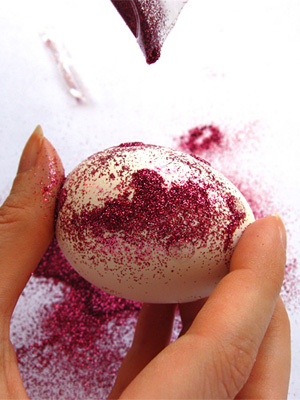 You won’t be able to get every speck of excess glitter because your fingers will still have some glitter on them, but you can do a pretty good job the first time around and do a second brushing after you’re finished with all of the eggs. When you’ve finishing brushing, set the egg in an empty egg carton or a bowl so it won’t roll away! After you’re finished with a shade of glitter, set aside the now glitter covered piece of paper and wash your hands to clean off the glitter. Repeat this process for every shade of glitter that you’d like to use and, after you’ve finished, take the individual pieces of paper, fold them in half until you’ve formed a sort of funnel, and pour the excess glitter back into its container. Kid friendly version: Art glitter can be a bit messy, so if you’d like to make this craft more kid friendly, you can use decorative colored sugars (regular table sugar would work, too) that can be found in the baking aisle. Instead of pouring the sugar over the egg, as you did with the glitter, shake a small pile onto a piece of paper and gently press the Zots covered eggs into the sugar. The effect won’t be quite the same because the sugar crystals are larger than the art glitter, but it’s still pretty cute and very kid friendly. Dyed eggs with plain table sugar dots would be very nice, too. really cute idea – simple, but right in style! These are SOOOOO gorgeous, I love them! I can’t wait to try this! Oh and I’ll be linking. LOVE! Thank you! The Easter bunny will be doing this for sure! That is brilliant! And given my penchant for all things sparkly and colourful I am sure I’ll think up some silyl ways to use this creative trick. Wonderful! I’m so glad that you all like the sparkly eggs. Thank you for the lovely comments, and I’d love to see your results if you do try them for yourselves. This is a cute idea. 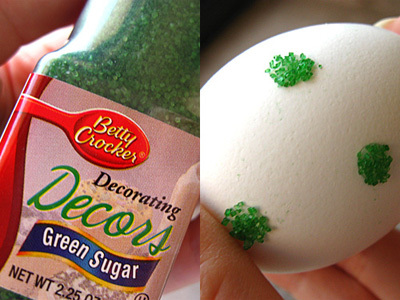 While I was looking to how to put dots on a egg, I found this cute idea. You are such a great egg decorater. I will start doing polka dots every easter year.Thanks! Great Thinking!! We love the Sparkly Dot Easter Eggs craft – the kids one, so we are going to share it on our site! I love these! I want to make these for Easter. Check out my blog this week. I am going to repost this super cute design! What a great way to get those perfectly round dots. I just posted some eggs on my blog, too. These are brilliant! Great idea!